What is litter? Litter is solid waste that’s out of place. It’s the kind of trash found on highways, waterfronts, school grounds, in parks and in bodies of water. Litter takes many forms- paper, plastics, metal cans, cigarette butts, glass, food packaging, tires and graffiti. Where does it come from? There are at least seven sources of litter- pedestrians, motorists, overflowing household garbage, construction sites and uncovered trucks. Litter is often blown by the wind until it is trapped somewhere, such as along a fence. Why do people litter? People tend to litter when they think someone else will clean it up, when an area is already littered, and when they do not feel a sense of ownership or community pride. Why is litter a problem? Even small amounts of litter are unsightly, unhealthy and dangerous. Litter causes blighted landscapes, can result in increased taxes to pay for removal, and can cause a decrease in tourism. Litter results in a loss of civic pride and can cause disease in people and animals, as well as fires and accidents on roadways. Stormwater Pollution Prevention - An important part of the goal of the Clean Communities program directly related to litter reduction is the prevention of pollution entering our local bodies of clean water. Did you know water from rain, lawn watering, car washing, etc. runs off our streets, roofs, driveways and parking lots into our watershed? Many Mind and Wagner Creeks, and Sandy Hook and Raritan Bays receive all the stormwater and runoff from the impervious (paved and hard surfaces) in our town, in addition to natural water sources to form the watershed for Atlantic Highlands. watershed from our storm water drains. Known as urban stormwater pollution, this problem causes reduced water quality, harms shell fish and recreational fisheries, and may cause illnesses and beach closings. Residents can help reduce the volume of run-off by installing mosquito-proof rain barrels, planting rain gardens with plants native to our area, and designing home improvements to include driveways and sidewalks made with pervious materials. 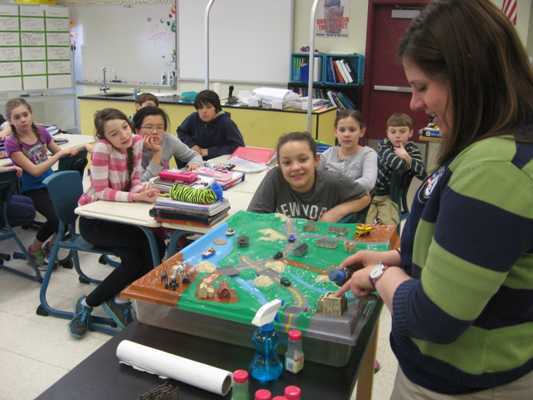 Amy Chianucci, Americorps Watershed Ambassador, demonstrates the negative effects of litter and pollution on a watershed model to students of the Atlantic Highlands Elementary School for Earth Day 2014. Stormwater is not treated; it runs through drainage pipes or through our streams directly into our area bays. Keep storm drains near your property clean and clear of litter! Make sure all pet waste is cleaned-up promptly. Report illegal dumping to the police department.